Any individual that has ever suffered pain in their legs because of varicose veins, which are twisted and enlarge veins that come to the surface of the skin, knows that it can be not only uncomfortable but very many times extremely painful as well. 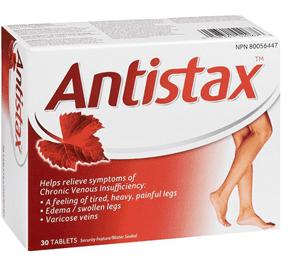 Often this affliction generally develops in the legs and ankles of an individual, but there is hope for relief with Antistax. This type of affliction affects over 30% of women and 20% of men in the United Kingdom alone, and this is not to mention North America and how many people suffer from this type of malady all over the world. In addition to causing discomfort and pain, unfortunately long-term effects of this unfortunate illness can cause problems with your heart later on in life as well. Once you’ve determined that you are afflicted with this problem, taking more antioxidants are one way to help ease the symptoms and even prevent them from getting worse, and Antistax has been reputed to be able to help take care of this problem. It’s because of the therapeutic properties from the red vine leaf that a flavonoid-rich extract was found and has demonstrated amazing beneficial results for sufferers of all types of vein disorders in a number of various studies. Antistax can be found in both capsule form as well as a gel for topical application, and although it’s been very popular and well regarded in Germany, Austria, Switzerland, and other countries, in some of different areas it is just becoming available and has been very well received. If you suffer from this type of problem, the big hype surrounding this product is the fact that by only taking two capsules daily after breakfast, it can help to relieve and refresh tired and heavy legs. They also have a cooling leg gel that also utilizes red vine leaf additives that can be massaged into the legs that is great after a long day, especially if you’re on your feet for a long duration of time. The costs varies from various online sites, but you are looking at around $20 to $25 for a 30 pack of tablets. The cooling gel will run you around $13-$15 or so. The company itself found that the red vine leaf that is used in Antistax dates back to ancient times. This vine has been used for ages in many different countries and it was as a doctor in the second century that documented its relief of not only vein problems in the lower limbs, but it’s also relief of skin disorders, rheumatic problems, bleeding in some cases, not to mention its potent anti-inflammatory effects. The commitment is this product is it is designed and guaranteed to help alleviate many different types of disorders, but especially vein issues in the lower limbs. After checking out what makes up Antistax and why this red vine leaf extract is so special, it seems that somehow the properties of this leaf have proven to improve blood circulation, which ultimately helps to alleviate the pain and swelling, and even can help to reduce the amount of veins shown through the skin. It really has gotten many glowing reports in regards to the study’s that have been done and how this extract can truly help people with this type of problem. After checking out many reviews and seeing how Antistax has worked for them, we would give a positive review. If you have any type of vein problems, then this is something you should look into. Another problem when it comes to legs is having to deal with spider veins but Vita Vein may help with this. What do you think? Does Antistax work or not?